Warning of Bad Seeds! – Wycliffe-Gate Part 2: Words MEAN Things | Truth with Snares!? The gravity of what this means to our missionaries is clear it is dangerous and alarming! Those who have sown the bad seed are causing us to reap a whirlwind! It is beyond ordinary false teachings exposed on this site -it is teaching another Christ and the evidence is in with bad fruit. The denials of Wycliffe and SIL do not account for the omissions attested to by Christians who are standing for the Faith once delivered to the saints Jude 3 (watch video below) there is a HUGE disparity on what we read to what these eyewitnesses state. Second, this is nothing new! There are a number of the Emergent & Organic leaders clearly connected with this bad seed of so-called “Chrislam,” see for yourself, I have linked here with our site and Apprising Ministries. Recently I began blogging about the issues with Wycliffe’s translation methodology and what it means for the state of missions today in Arabic parts of the world. I’m gravely concerned that in an effort to ‘contextualize’ the Gospel, God’s Word is being mis-translated. Specifically, reports are coming out (and indeed have been coming out for quite some time now) detailing how the familial terms used for God the Father and Jesus as the Son of God are being replaced with terms that are more ‘comfortable’ to those from a Muslim background. I plan on doing more posts in the future that bring some of these accounts to light. God HAS spoken – authoritatively and definitively through the prophets of old, through His apostles, and ultimately through the incarnation of the Word in the Person of Jesus Christ. God has definitely spoken to us, to His glory. The Scriptures are very precise in what they say. On the other hand, Wycliffe has spoken. They’ve translated God’s word into languages for a huge number of people groups. What a lofty, noble and weighty goal! Yet somehow we’ve arrived at a place where how God chose to reveal Himself (as a Father in God the Father, and as a Son in the Son of God) is somehow different from how Wycliffe has chosen to reveal God to others. That sounds like sufficiency to me. Wycliffe may STATE that they believe that God’s Holy Word speaks “with supreme authority in all matters of belief and practice”, but apparently God’s word as HE revealed it isn’t sufficient ENOUGH, and must be changed. Folks, I’m not a linguist or a current missionary to the Arab world. But from where I’m sitting Wycliffe appears to believe that in order for Muslims to be saved, the word that means FATHER when it applies to God must changed in their Arabic and Turkish bible translations to mean something more closely akin to “guardian” or “lord”, because Muslims have a difficult time with the concept of God as a Father. Wait a minute. Either God’s Word is sufficient, needing NO HELP from man, or it isn’t. (2 Timothy 3:16-17) All Scripture is inspired by God and profitable for teaching, for reproof, for correction, for training in righteousness; so that the man of God may be adequate, equipped for every good work. Which is it, Wycliffe? Is it sufficient as God delivered it to us or not? One critical key facilitating the so-called C5 concept is the way they view new Bible translations for peoples of other faiths. 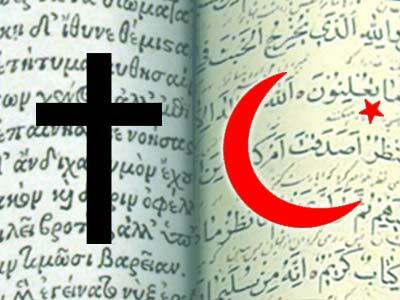 In 1987, a new alleged harmony of the gospels was produced for Muslim readers. This book is a diglot with opposing pages printed in Arabic and English. It is a very important example of the C5 group’s effort to retheologize the Son of God for the Muslim reader. Some C5 Bible translators have felt the need to shade the meaning of certain Greek terms such as Lord and Son of God so that those of other faiths will be more open to considering the claims of Christ. Perhaps this unusual and unexpected divide in Bible translation has come about because of the philosophy that spawned what is called dynamic equivalency. Whatever the original intent of this translation model, it has been used as a vehicle that allows the translator to insert much more of his or her interpretation into the translation. The ‘word-for-word’ correspondence model can also be manipulated by the translator but it is more difficult to do. The ‘thought-for-thought’ translation philosophy of dynamic equivalency allows the translator to insert various nuances of present day culture. While it is customary for evangelists to use the biblical record selectively and to introduce theological truths at various stages in evangelism and Christian nurture, there is no justification for changing God’s Word, the Bible. This removes the foundation upon which a Christian life is built. If God’s record no longer exists, what is the framework of truth for a new believer and how can one be discipled into the truth of who Jesus is? The Bible, as recorded in the original languages, is the only source we have for a biblical worldview. When we begin to integrate the message of the Bible with that of other religions, we lose the foundation of our worldview and move into syncretism. While we acknowledge that there is some truth in other religions, we also recognize the ways in which that truth has been integrated into a non-biblical worldview. Changing Bible translations to agree with Qur’anic worldview or the worldview of any other faith system will cause us to lose our touchstone. Friends, can we not see the damage that is being done in these geographic areas in the name of contextualization? For years baptists seemed to have led the charge when it came to fighting for the inerrancy of Scripture. Amen for the men who fought that fight. But now the sufficiency of Scripture is coming under attack from the very people that we have trusted for so long when it comes to properly translating God’s word. For the sake of contextualization, and making it ‘easy’ to reach a people group, these translators are changing God’s Word. In essence this is sending a message that God’s Word is not sufficient as He gave it to us, and something more is needed. C5 groups then run with this aberrant translation and syncretize Christianity and Islam. No. I’m sorry. It’s doesn’t work that way. Humans don’t have the authority to change God’s words in order to make it more palatable to other cultures. Instead, God’s unadulterated Word, when properly preached transforms human hearts, and His Word is absolutely necessary for revealing who God is, as HE desires to be revealed. If there already exists bibles in Turkish and Arabic that are of decent quality, (and they do exist) then why does Wycliffe feel the need to reinterpret the bible in a new way? Where is the definitive evidence that the C5 missiological efforts are bearing TRUE biblical fruit of repentance, turning from worshiping a false god (Allah), and turning from treating Muhammed as a prophet of God? Why are C5 missionaries referring to the Qur’an when attempting to validate the authority and veracity of the Scriptures? Doesn’t that set up the idea in potential Muslim converts that the Qur’an holds a position higher (or equal to) than Scripture? How do C5 missionaries expect to teach new Christian converts about the familial relationship that exists between the Father and the Son if their translations are neutered to remove those terms?